Last Sunday, I packed up my sewing machine, my blocks, and all my sashings and cornerstones and headed to my mother-in-law’s quilting room where she had a big enough design wall that I could lay out my quilt blocks before I sewed it all together. Above is all my blocks in their initial layout. I always like to do this and then stand back and analyze. Does everything look good the way it is? What needs to be switched a bit? Do I want to emphasize anything? Now that it’s up on the wall it’s much easier to do these swaps and really see what’s happening. I didn’t make too many changes to the intial layout but I did make a few – especially with sashing placement. 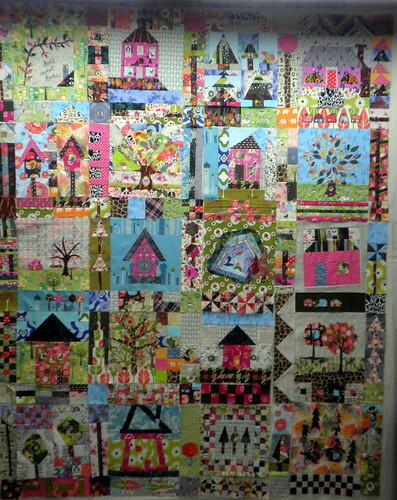 I tried to have some of the sashings blend into the blocks to help add a to the crazy feel of this quilt. I really, really , really LOVE how this quilt top turned out! I can’t wait to see what the quilting is going to look like! 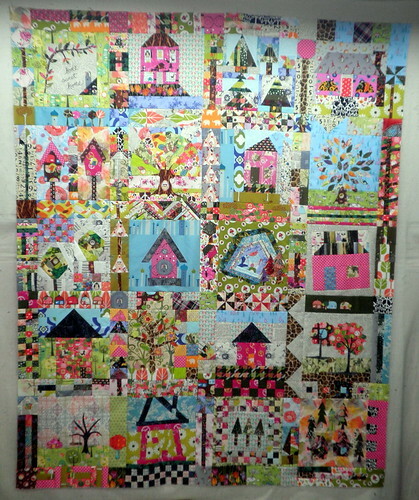 I still have LOTS of sashings tutorials to share with you if you want your quilt to look like this one! Thanks again to Aneela Hoey for the inspiration for this quilt along! It’s been a really fun couple of months! Mine doesn’t look like hers at all but I do think I created a feeling of organized chaos which is one of the elements I just LOVE about her quilt! I love your quilt! I think the pops of black make it very dramatic! Oh my - your quilt is absolutely glorious!!!! It would fit in my house just perfectly:) I was so excited when I saw it!!!! Congratulations!!! Your quilt top is SO fun! There's so much fun stuff to look at and it does flow pretty well. I seem to be collecting orphan blocks in a variety of sizes and themes and have had in mind to put them together kind of like this when there are enough. They may not end up related enough for something like this, but that's the plan. I love the inspiration quilt too! You did a great job! So fun & colorful - LOVE it! Oh, what a *FABULOUS* quilt! I'm in awe!!! Love the way it turned out. It is so full of joy! Love the energy of this quilt! Thanks for sharing at the Minutes for Me Linky Party! I found your beautiful quilt on flickr.com and LOVE it 100%! I am seriously gonna give it a try and hope it turns out as lovely as yours! Thanks so much for sharing....what an inspiration it is!